It’s another Pinterest Challenge today!! I always browse through Pinterest and get tons of inspiration. This time I was looking at Fall ideas and wanted to make these DIY crepe paper pumpkins. Our Pinterest Challenge is hosted by Erlene from My Pinterventures and is for you, and us, to get not only inspiration, but to also try out what we see on Pinterest. 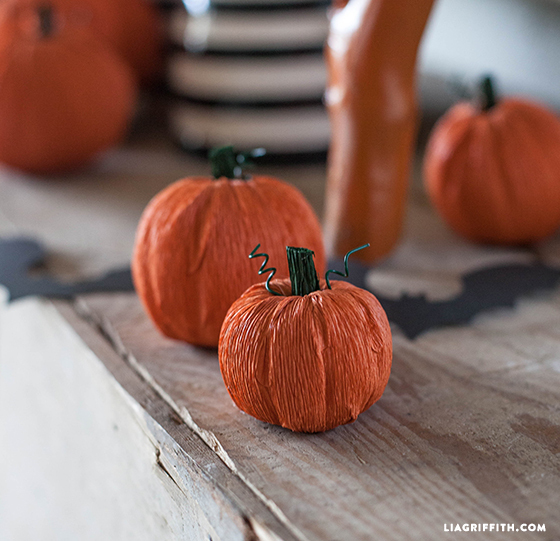 I saw these adorable crepe paper pumpkins by Lia Griffith and just needed to give them a try! Aren’t they just so perfect?? They were easy to make as well! And Lia’s tutorial is so detailed and easy to follow. I followed Lia’s tutorial step by step, except that I used white crepe paper instead of orange. Also, my styrofoam balls were not easy to crush, so they still look quite round. But that’s ok. Same with the dents Lia added to hers with the dowel. I couldn’t get them in and they don’t show on mine. This is how mine turned out! I decided to not add the wire curl and I also used real little wood stems from the backyard. These little pumpkins fit in so well with my neutral decor and I think I’ll be making some more in different sizes. Very cute and even more special because they aren’t exactly like the ones on Pinterest. You made them YOURS. I made a book page pumpkin last year and it turned out kind of crazy. Couldn’t get the pages to lay flat on the pumpkin base. So it wound up looking ruffled. But once I added a little glitter, ta-da, it was better!! Would love for you to stop by to see it – http://onceuponatimehappilyeverafter.com/dim-did-it-myself-book-page-pumpkin/. These pumpkins are so fresh and bright Katrin. They suit my decor, I love your white pumpkin variation. These look great in white, very classy. The texture of the crepe paper is lovely too. These came out really pretty Katrin. And really you made them from practically nothing! These are great! I’ll have to hop over and check out the tutorial. I may have the supplies to make a few of my own. They are so easy and fun to make Erlene!! Thanks for organizing the challenge, always fun to participate!! This is such a fun fall craft. I love the look of your white ones. Pinning to my fall decor board. I like how you used twigs for the stems, and the contrast with the white crepe paper. Katrin, I love your Little paper pumpkins. Much better than the orange ones in your inspiration picture. Your other fall crafts are gorgeous, too. You have excellent taste when it comes to home decor! Aw Thank you so much Habiba, that means a lot!! So cute – they do go perfect with your decor! Wow, I’m not sure if I like the white ones or the inspirational orange pumpkins better! I think they’d be great in a tray with various fall colors. I really like both a lot, just that for my decor the white one’s fit in a little better… Thanks Lydia!! What a clever idea to use styrofoam balls & crepe paper! They are beautiful, I want to make all kinds of them now. Love the idea to use natural sticks! These are SO CUTE!!!! Love them. I’m tempted to make them myself, but I already have so much on my plate right now..Definitely pinning it for later. Awesome, they are so easy to make, even for a quick afternoon creativity release, lol. Thanks for the visit Chelsea! I love these little pumpkins. They have charm and personality. Very cute! I have been looking for some fall crafts to try with my boys too and these sound fun. Pinned. Oh, I wish I’d get some pumpkins here where I live. That is why I have to make them. Happy you like them Lisa, Thanks for stopping by! !